I love the months of December, January and February in Mumbai. A wide range of seasonal fresh fruits and vegetables make their appearance in the markets during this time. One of my favourites to make a grand entry are oranges. Juicy, fresh and aromatic with their lingering, unique, citrusy taste, aroma and flavour. One of my favoured ways to eat oranges is to peel the outer skin, segment the sections and pop them into my mouth to savour their exquisite taste and goodness. 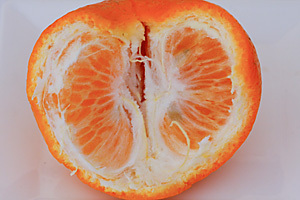 This, in my opinion is the simplest and one of the best ways to devour an orange. There are of course other ways to relish them. I do so in the form of cakes, cookies, salads, certain desserts and the topic of today’s post the komola kheer or orange kheer. I never let an orange season go by, without making a batch of komola kheer and if Ro insists, which is often the case, many batches throughout the season. 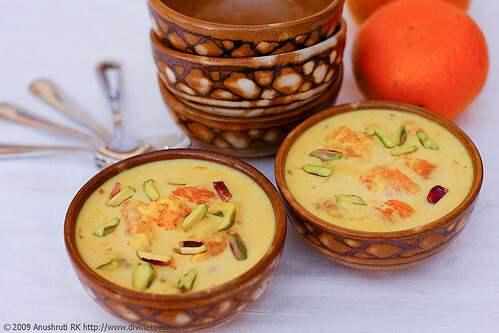 I actually had no plans of putting up another kheer recipe on divinetaste this soon, particularly after this post. I would like to maintain a certain frequency before similar types of dishes are published. 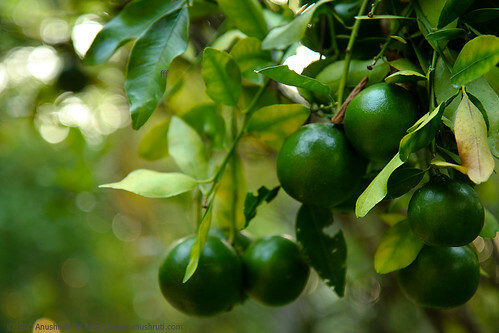 But then, oranges will soon be out of season here and I couldn’t think of waiting for another long year (well, almost!) for these divine fruits of nature to start making an entry into my home again and for me to write this post. So…here we go. I do hope you will relish the juicy chunks of oranges dunked in thickened, condensed, sweetened and delicately spiced milk, studded with green gorgeous pistachios as much as we do. I make this dessert with a certain type of oranges called Malta oranges that we get here in Mumbai. Valencia Oranges or Clementines might work just as well. This recipe is from an erstwhile household in Bengal, made from oranges grown in their own farm. Heat the milk and bring it to a rolling boil over a medium flame, in a heavy bottomed wide rimmed pot or wok*. Reduce the flame to low and thicken the milk till it coats the back of a spoon or until the milk changes it’s colour to a nice cream colour, stirring in between to prevent the milk from sticking to the bottom of the vessel. This should take any time between 1 hour 15 minutes to 1 and half hours. Once you reduce the flame, it doesn’t require constant monitoring, although you need to watch it in-between. The milk should be reduced to a little less than half the original quantity. Add the sugar, cardamom powder and saffron powder, lower the flame and cook for 5 minutes more. Cool to room temperature and add the orange segments. Chill for at least 3 to 4 hours and serve garnished with chopped pistachio nuts*. *Don’t use an iron wok without coating. Iron woks or pots with enameled coatings or non-stick cookware can be used. *I usually make this in the night and leave it overnight to chill. The more the oranges soak in the spiced liquid, the more heavenly they taste. I've never tried a pudding like this before but it sounds fantastic. I don't cook with oranges too often. I love oranges and mostly just peel them and eat them. I will have to make an exception. YUMMY!!!!!!!! looks great!! i absolutely love all your pics!! Also, when do u add the saffron? just for garnish? i will def try this.. i like anything with oranges! Never had or even heard of orange kheer. This looks absolutely delicious. A must try. Love the pics and the way you've written. very nice! Sara: Do give it a go! I'm sure u'll enjoy it. 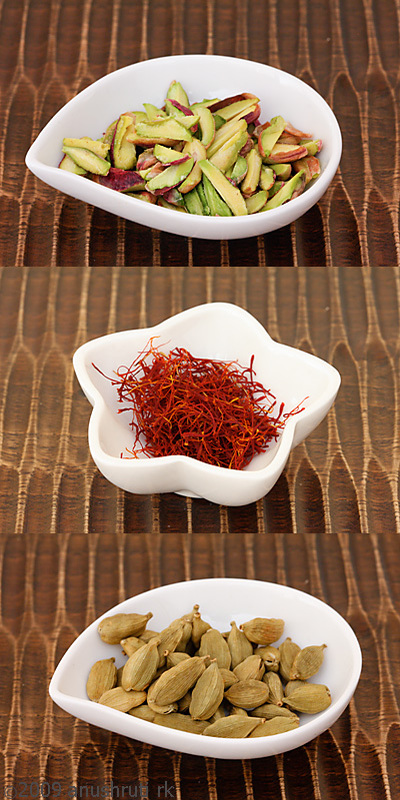 Soumya:You need to add the saffron with the cardamom powder. I have added this in the recipe. Let me know how you like it. Vidya: Glad you liked the post. Anu.. i think you wrote cardamom powder twice now instead of saffron..haha… preoccupied excited mom-to-be huh? Sorry Simi. But the pictures and accompanying information are too tempting to resist. I don't read the recipe though:)!! This looks so delicious! heading to the shop today to get some juicy oranges…. I tried this out for V-Day…needless to say, it was delicious..I couldn't get hold of Clementines, so I had to make do with Minneolas. Though I couldn't get rid of the white skin altogether, it was still praise-worthy! Ohhh Anu!!!! i made this yesterday!!! its a Super Duper Hit!!!! We all Loved it Very much!!!! Bookmarked!! Looks too good and sounds yummmyy… Making it for sure veryyy soon!! that looks super yummy. A quick question..instead of using milk, can i substitute with the evaporated milk from a can? I see nestle's evaporated milk in stores, wondering if that's a good substitute? Please let me know. Aarthi: I havent tried this with evaporated milk so I cant say…I suggest you go ahead with milk as that is the tried and tested, traditional way as well! I'm really touched and honoured that you have this to say about me and my work. Look forward to hearing more from you. Very keen to try this but short of time!……..Can this be made with condensed milk? and how many people will this serve? Shruti: You can use condensed milk to fasten the cooking process. It would serve 4 to 6. I just cant thank you enough for tis recipe…I absolutely loooooove oranges and the same is true for my tod…made this today for a family gathering and cant tell u wat a hit it was….!!! Love all your recipes and oh my God your kitchen i love it. Already made Orange kheer, sooooo yummy. Me and my hubby both loved it.Thanks a lot. I made this kheer today and totally loved it.I am posting it on my blog with your recipe link.Thanks for sharing this wonderful Bengali treat. sapana- Glad you liked it. Do share the link.